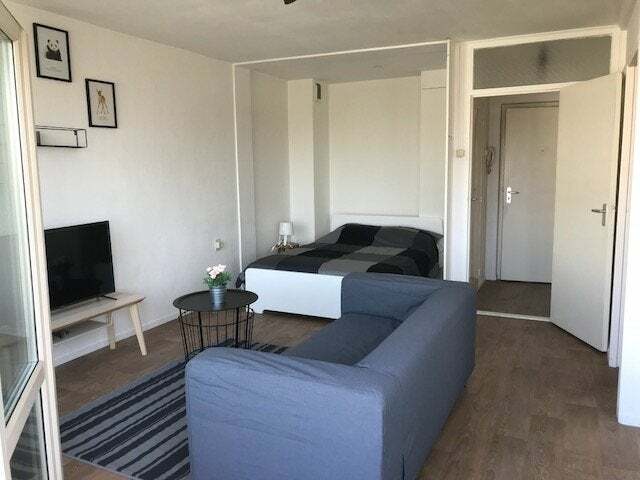 Brand new fully furnished studio in Mariahoeve for rent! Available from the 15th of March. At the moment we are furnishing this apartment. All the appliances will be available such as a stove, washing/dryer machine, vaccumcleaner and fridge. There is a 1.60 bed, a sofa, tv, diningtable with 4 chairs and a big wardrobe. Rental price: € 827,00 + € 60 euro advance payment heating + € 37 servicecost. The apartment is situated on the 9th floor of the building so you have a fantastic view over the city centre of THe Hague. Centrally located in relation to shops, (international) schools, tram and bus stops and the roads N14, N44 and A12. And only a 10 minute bicycle ride into the city. Income requirement: Minimum € 2.400,00 per month.